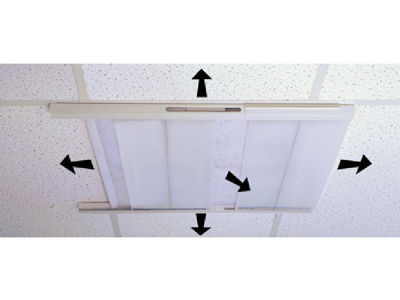 Alternative to painting or replacing ceiling grids. Don’t Paint or Replace – Get a new look over night, no permits required. GridMax high grade vinyl is installed on existing metal grid which covers old rust damge and prevents new damage. Grid cover makes your t-bar look brand new. GridMax is a patented snap-on grid cover designed to fit over 15/16″ typical (24 mm) and 1″ standard suspension grid systems. Painted grid can alter the fit, check the width. 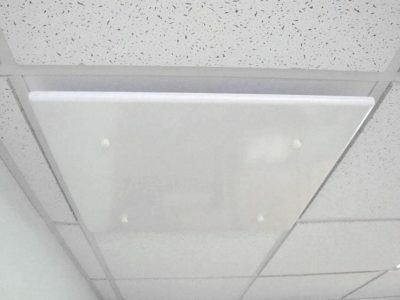 These UL fire rated vinyl ceiling covers are suitable for both kitchen or dining areas, and are available in various colors to match your ceiling. CA Health Code and other states prohibit painted t-bars in food preperation areas.